My Lord, that's for sure! Many years ago, a candy maker wanted to make a candy at Christmas time that would serve as a witness to his Christian faith. He wanted to incorporate several symbols for the birth, ministry and death of Jesus. He began with a stick of pure white hard candy; white to symbolize the Virgin Birth and the sinless nature of Jesus; hard to symbolize the solid rock, the foundation of the Church; firmness to represent the promise of God. The candymaker made the candy in the form of a "J" to represent the name of Jesus, who came to earth as our Savior. He thought it could also represent the staff of the Good Shepherd, with which he reached down into the ditches of the world to lift out the fallen lambs who, like all sheep, have gone astray. Thinking that the candy was somewhat plain, the candymaker stained it with red stripes. He used three small stripes to show the stripes of the scourging Jesus received, by which we are healed. The large red stripe was for the blood shed by Christ on the cross so that we could have the promise of eternal life. 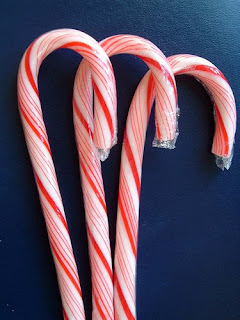 Unfortunately, the candy became known as a candy cane - a meaningless decoration seen at Christmas time. But the true meaning is still there for those who have eyes to see and ears to hear. Lovely. I forgot that about the candy cane. thanks for the reminder. Isn't it lovely that something as common as a peppermint candy symbolizes God's love and ultimate gift! The red and white stripes are a visual enforcement of the power of the life, death and rebirth of Jesus Christ. The pungently sweet taste and bracing aroma of the peppermint stimulates our other senses, making us feel more alive for that moment. This is a moment to say thanks, offer praise and know that we are loved. Good Morning Tabitha and Virginia! I try to remember this 'true story' when I see the candy cane and I think this will do the trick. Thanks Connie. I know you chose this subject right away for our Christmas week. What beautiful words and a nice way to remind the little ones about Christ during a Santa saturated week. Connie, thank you for a lovely post. I had forgotten this symbol of our Christ's birth. Connie, what deep meaning for a candy treat. I've heard this story before. Today as I read it I was reminded of the power in the blood and in the stripes of Jesus. I believe that healing is spiritual and emotional of course, but also physical. God Bless. Thank you for teching me its true meaning...I will look at it w/ different eyes from now on...AMEN! Have a blessed day, everyone. Thank you Connie! May the Blessings of Christmas be yours. And may we all think of Jesus everytime we see a candy cane through the years to come. Karen, I hadn't heard this story either. Thanks Connie, for sharing it. Wow. What awesome symbolism. Connie, I love the candy cane story. Isn't it great to know the original meaning behind something we see all over the place?